Yesterday we got back from a 9-day camping holiday with two kids under five on the coast. The excitement is still here, the kids are still on the campsite in their minds. They were outside 24/7, sleeping under the stars, being in the sea all day, playing with pine cones and stones, getting together with other little campers, muddy and sticky at the end of the day, eating picnic on the ground, and basically, having time of their lives. After a long time, they were TV/monitor/cartoon free for 9 days! So while it's fresh in my memory, I'd sum up our experience and write down tips of camping with kids. We've camped with the kids for a music festival before, but this is the first time we stayed for so long, and we took a grandma along. To be noted though, these tips are for camping in a tent. So if your family opt for an RV (camper van, mobile home or caravan) or a glamping tent, probably not all of the tips make sense. Don't buy tent in a department store or supermarket. Make a trip to a specialized shop for camping and outdoor sport and get them to help pick what you need. Buy high quality tent, air mattresses, camping chairs and table, and kitchen cupboard or shelf if you need. We've got this Quechua 4-person tent with two bedrooms on each side. Each bedroom fits a 140 cm wide mattress, so four people can fit comfortably. Grandma slept in one bedroom, my husband, the baby and I in another, and the toddler slept in a snug space between the bedrooms that is normally a living room. There was a thunder storm with very strong wind the whole night the fourth night we were camping, and the tent proved to be sturdy and completely waterproof. The height of the tent is around 2 meters, which means most people can stand normally inside it. I'd suggest you to get another tent or a pavilion where the family would gather during the day to avoid toys and food flooding the sleeping tent. We had this basic pavilion to fit a dining table and four chairs, a hanging toy rack for the kids and one cooking station and a little fridge. 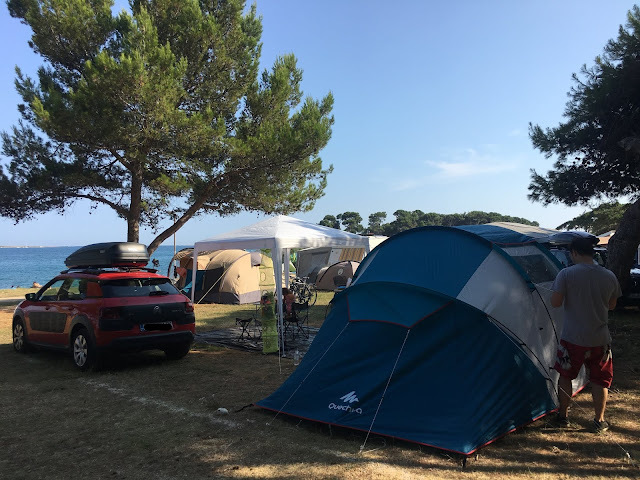 We opted for Arena Camp Medulin at the south of the Istrian peninsula. It's 3-hour drive from Zagreb where we live, and is close from many attraction we wanted to visit. Unless you want to camp in the wild, search for a campsite with good facilities. Sanitary facility is essential. Ours was clean and well maintained, with showers, baby tub, toilets (even for the small ones), sinks and dish washing sinks. The camp provided several spots for barbecue, car wash, laundry facility, water-park and playgrounds. If you're a first time camper, don't be afraid of the hygiene and sanitary facilities in today's camping ground! We keep joking that it's mostly cleaner than our home! After some research, we plan to try Camping Straško on Pag Island for next summer. Baby bath, small toilet, low sink and mirror, they thought well about the kids! Don't hesitate to make use of the electricity. Most campsite offers electricity plug on each parcel. We didn't want the hassle of a stove with fire and gas bottle, so I brought along a small induction cooktop from IKEA. With the convenience of home, we could cook regular meals. Stunned with the efficiency of this cooktop, grandma wanted to buy one for herself. We brought a small portable fridge and table lamp to lit the dining area at night, although we brought solar lamps for the ground and LED lights on battery for around the tent just for the romantic feel. It's very probable to forget things when you pack. And when you go camping, there are a very long list to bring along with you. Create a check list to help you packing, dividing it to sleeping necessities, cooking and eating necessities, lounge and seating needs, hygiene, medicines and mosquito repellent, kids' toys including bikes and beach toys, and electrical equipment including cable extension, adapters if needed and lighting. A meal plan will also guide you through what to pack and what to buy from day to day. A shop inside a campsite tends to be very expensive, so you probably want to make a trip to the city for groceries shopping. We lived on regular breakfast like at home (pancakes, french toasts, bread and spread, cereals), different kind of salads for lunch (tuna salad with pasta, Caesar chicken salad, mix vegetable and beans salad) and mostly barbecues for dinner that my husband made at the public barbecue place. We added a roof rack and a roof box to the car to bring all the things we needed. You can also add a bike carrier if you want for taking bikes. Some people tow a smaller trailer to take even more stuff if they plan to stay much longer. Don't forget to take things to keep the kids occupied: coloring supplies, board games, playing cards, bubble wands and balls. Most kids we saw in the camp is gadget free, and they're open to play with other kids. Our kids enjoyed things as simple as pine-cone. When they're outside in the woods 24/7, every little thing is interesting. During the day they spend most of the time in the sea anyway. Once you check in, you will need to choose a lot. We booked our lot in the premium zone, but we had to pick the exact number of lot when we got there. So here you need to decide on what is important: proximity to the beach, or proximity to sanitary facility? Shade or sun? Do know that the wind is stronger when you're closer to the beach, and weaker when you're deeper into the woods. We picked a lot that is immediately on the beach with enough shade for both the kids and grandma in the afternoon to rest, but enough sun in the morning for sunbathing. It was around three minute walk from the sanitary object and the toddler was able to go by herself and back. Ask the reception what kids (and adult) activities they offer. Our camp organized sport activities for adults (pilates, aerobic, etc) in the morning at 10am while also organizing mini club for the little ones. We didn't do any activities in the morning because we'd all be in the water then, but the kids enjoyed the evening activities a lot. At 8pm they organize mini disco, magician show and games. There was also teen club for older kids. One of the good things about camping is the kids learn to be independent. There are many chores to be done in the camp and it's a perfect time to delegate suitable chores to the kids. Our kids are too young to independently wash the dishes, but we saw many kids older than 8 washing dishes at the sanitary centers for the whole family. Our toddler was assigned to collect dirty dishes and wipe the washed one dry. They could also get fresh water for the canister, take out the garbage, mop or wipe tent base, go to the shop for foods or help in food preparations. Our family is not used of being stationed in one place for 9 days straight, so we needed some refreshment along the way. We took the kids to Pula Aquarium and gave grandma a day for herself at the beach. The kids enjoyed the amazing aquarium placed in an old fortress of Verudella. On the last evening, we all went to Pula for dinner and evening walk around the Colosseo. Camping is fun, and don't forget about that. It's less stressful than staying in a hotel or private accommodation. People are in bathing suit 24/7 and everyone is open minded. The beach in your front yard also means no need to carry millions of beach necessity with you every time you go for a dip. We didn't have clocks, we didn't care what time of the day it was, we did thing because we wanted to, not because it was the time. And that finally felt like a real holiday. We shared a couple of beers with our neighbors, the kids played together although they didn't speak the same language. It's also wise to talk about camping etiquette with your kids on the first day, such as not to walk across someone else's lot, not to be noisy at sleeping hours, clean after themselves especially in sanitary objects, leave the campsite clean and put the lamps dimmed or on low light late at night. Now that you're ready to go on an adventure with the kids, enjoy!